Not just out of breath, but flat wasted tired. Sweaty and filthy. Waders not breathable enough. Air not breathable enough. And we were still on the way in. It’s not that we’re that out of shape. JT had in fact just run a half-marathon a few days earlier. But the brook trout death march requires a unique kind of exertion, characterized by toil without progress. And falling down a lot. Technically speaking, the brook trout death march comprises a downslope progression through discrete ecological elevation/vegetation zones, and then a regression back up through them. In between, theoretically, is brook trout fishing, the quality of which is directly proportional to the difficulty of the march in. Theoretically. In this case, we had first hiked through what Michigan ecologists call the Hardwood-Conifer Swamp and then struggled through the Northern Shrub Thicket, and were finally working across the Northern Wet Meadow, toward the stream. We have found the pastoral term “meadow” to be misleading. Each step through head-level grass, dogwood, and willow brush is either down into sucking watery muck of unpredictable depth, or up onto a rubbery hump of tussock-sedge. Underfoot are submerged logs and bottomless holes. A hiker once told me that one vertical step – say, up onto a log instead of over it – costs the same energy as thirteen horizontal steps. I think he had never hiked through a Northern Wet Meadow. Its “hummock-hollow microtopography” is an energy sink either way. Halfway across this particular meadow we now rested, balancing on the tussocks, heads above the high grass, gulping fresh air. Turkey vultures wobbled on the valley thermals; deerflies spun around the micro thermals of our carbon dioxide exhaust, waiting for us to hold still just long enough. Or to die. If we had not been gasping for air, we would have avoided talking about how far we were from the overgrown two-track on which the truck waited, crowded in the thick undergrowth, or about the cold beer in the cooler. Because we were committed. Big brook trout. Maybe. Ahead of us stood a clump of skeletal tamaracks that suggested a streambank. Forward march. That morning JT and I had made breakfast at our campsite, a small white-pine bluff on a perfect northern Michigan brook trout stream: honey-gold water glassing over sandy gravel with woody debris carving holes and undercuts where wild and native arctic-remnant char thrive. But it was too late. The death march seed had been planted: rumors of an unnamed stream, hard to access, big brook trout. Spoken of with sideways glances. Shadowy threats of sudden violence, should the secret get out. Recently, JT had heard where it was, exactly. Or should be. And we had all day to explore. And that afternoon, panting and filthy, we did finally reach the stream in the middle of the meadow. The morning’s conversation rose back up in my throat like the noxious gas out of the muck at our feet. The stream in front of us, striven for these many hours, was black and warm, stagnant, choked with lilypads and cattails. Unwadable slime and muck. Dark colorless frogs the only sign of vertebrate life. I made one cast. My CDC-and-elk lay unnaturally on the water. When I tried to pick it back up it hooked a lilypad stem and I had to break it off. We looked at each other and then back at the dark and tangled edge of the Northern Shrub Thicket that we’d stumbled free of an hour before. It was three hundred yards of Northern Wet Meadow away. We headed back toward it. It took an hour to get there. 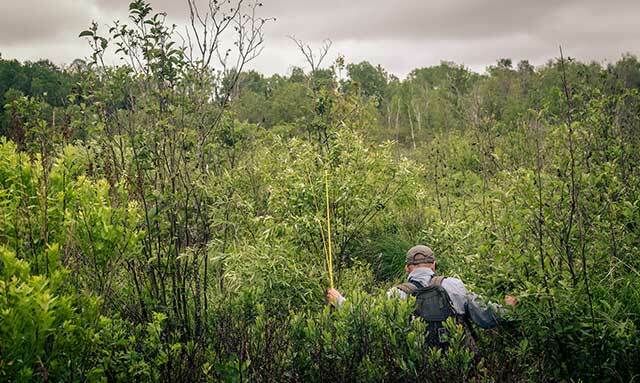 The alders distinguish themselves among other thicket shrubs by growing at a forty-five degree angle from vertical, weaving with their neighbors’ trunks like wheelspokes; hazelnut, bog birch, and wild raspberries grow up through the spokes. An angler passing through must repeatedly decide: do I force my way through the tangle ahead, or find a way around? The 19th-century Royal Navy admiral Horatio Nelson is reported to have advised his captains, facing large, complex formations of French ships, to “never mind maneuvers; always go straight at ‘em!” Generally, this advice works on a brook trout death march. One can spend hours trying to find an easier path, wandering far off course; or one can, with a bit of momentum, burst through the snarl in front, bark and debris and sweat flying. But sometimes the snarl proves impenetrable and stops you and your momentum dead; Lord Nelson was famously killed at the 1805 battle of Trafalgar: HMS Victory’s rigging tangled with that of the French 74 Redoubtable, and Nelson was shot on his own quarterdeck at close range by a French marine. JT and I did eventually make it through the alders, scratched and drooping, with twigs and leaves and spiderwebs in our collars and ears and hair. We were finally back in the Hardwood-Conifer Swamp: black spruce and big cedars and an open, mossy floor. Nice. Except that where we had struck this one happened to be a catastrophe of black spruce and big cedars in various attitudes approaching horizontal, tossed like pick-up-sticks. Ecologists say that this kind of windthrow is a “primary natural disturbance” in the Hardwood-Conifer Swamp. We certainly felt disturbed. No choice. Forward march. According to my GPS, the beeline-distance to the truck was only two hundred yards. As in only a small bee can actually take the straight path. Anything larger can’t pass through the gaps in the deadfall weave. And so, another hour of backtracking, crawling, swearing, stumbling, and wiping sweat-fog from our glasses which we dare not take off for fear of losing an eye. But we made it. Soaked with sweat, abraded, and bugbitten. Lesson learned, we said, brushing debris out of our hair and scraping muck out of our bootlaces. Builds character, we said, checking our waders for new holes and counting rod sections. Here he succinctly describes the philosophy of a brook trout death march: the addled mind that drives an angler away from known-good trout water into the tag alders in the first place; the wild-goose nature of the object (an idyll of big, undiscovered trout); and the rueful expectation with which the angler views future death marches – inevitable and already regretted. But any reader of Voelker knows that he hung up the death march long before he hung up his waders; he bought a private brook trout pond that he could drive to. Recently, an older (not much) friend was telling me about a trip he makes every summer to a lodge in northwestern Minnesota. We fly anglers have chosen well, I thought smugly, as our sport isn’t so perilous to life and limb that we have to give it up as we near retirement. Imagining Brokaw on a flats skiff; Maclean fishing the Big Blackfoot by himself, though his friends wish he wouldn’t. And then I remembered the brook trout death march. Scratches on my neck and arms just starting to heal. Crazy, I thought. Not worth the risk these days. My phone buzzed. A text message screenshot of an aerial photo: a narrow black meander snaking through dark green riverbottom.